I’m very pleased to announce that Rack Toys the Print edition is totally sold out. It’s gone and not returning to print any time soon. However, I feel like there is still a story to tell and I’m happy to say that the new E-book version of Rack Toys will debut just before Christmas 2017. It will be expanded with approximately 20 new pages of exclusive content and goodies. This has been a wonderful, rewarding journey that I totally encourage you to go on should you feel you have a book in you. Seriously, go for it, it will change your life for the better. Follow my progress on the Rack Toys Facebook page or follow me on twitter for daily updates. A great deal for the holidays! Rack Toys is now available at the Mego Museum Mall and offered as part as the Big Bundle, an unprecedented value (and terrific Christmas gift) for the toy collector. CLICK HERE TO CHECK OUT THIS GREAT OFFER AND HAPPY HOLIDAYS FROM RACK TOYS! 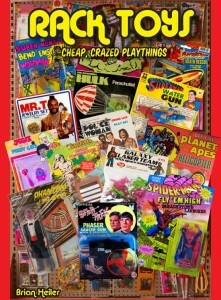 Very happy to announce that Rack Toys: Cheap Crazed Playthings is featured in this month`s MAD magazine. Time and Newsweek are nice but this is the highest honour somebody like me can hope for. More coverage is to follow, keep speading the word. Get “Rack Toys: Cheap, Crazed Playthings” today. 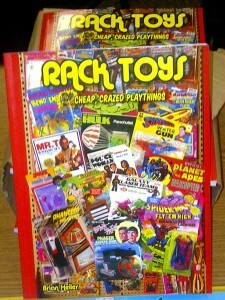 Our inaugural publication, Rack Toys: Cheap, Crazed Playthings is now IN STOCK and now available to order. 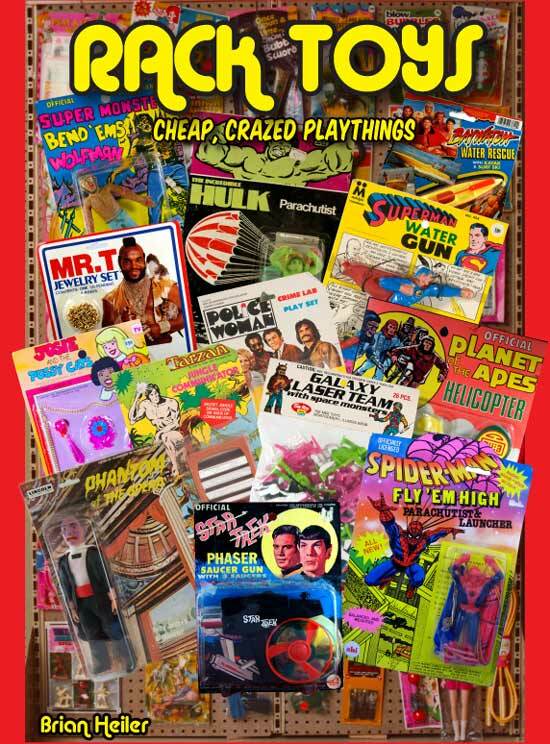 This 144 page, full color tome is $19.95 and features hundreds of sometimes weird and rare Rack Toys from the 1970s to the 1990s. Introduction is by Jason (Geek Shall Inherit Podcast/ BifBangPow! Toys) Lenzi. As a bonus, if you order it from us at the Plaid Stallions store you’ll get three exclusive Rack Toys post cards featuring images and artwork from the book. Look for more fun titles coming from Plaid Stallions Press in 2013.